I have finally got up to post 100 of my blog! And it is about time! 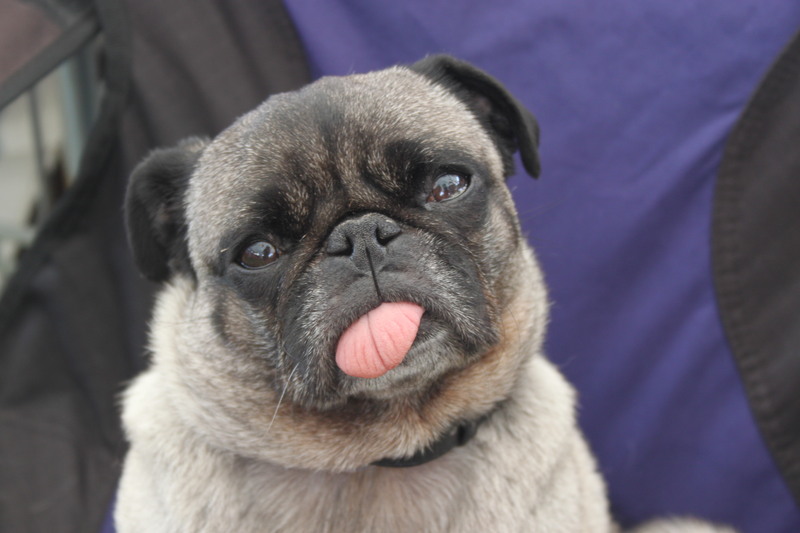 So to celebrate I present a pug with its tongue sticking out! I have been quite quite this year as it has been constantly busy since New Years. In the last 3 months I have had to deal with a story that went international, a new line manager causing more work than help, losing my job, my partner losing his job, interviews and having the prospect of having to move to Brighton. It is so hard to keep up with blogging, gaming and other activities that are so easy to enjoy when your job is not on the line or when you have lost it so it is easy to see why I haven’t been blogging. It has been a very stressful year and it looks to continue for the next few months while we move and deal with a number of family related events or commitments. In this time of financial concern for everyone there are few jobs or opportunities so I am still struggling along with so many other young people. What is worrying is how in 2025 we will have the flip of this where there will not be enough people for the number of jobs that will need to be filled but there will still be a lot of my age group that will have little experience. Only recently in October I hired a Designer and there were so many applicants that applied with over 12 year of designing experience for a part time low paid design position! There were art directors for well known magazines, studio leads and designers of house hold brands for a job were they would only get £11,000 a year as an in house designer with no real progression or design respect. That is how this is effecting the young people as they are up against highly skilled individuals who have been made redundant. I am up against these people now as I hunt for a job so you can see why I am struggling! I only graduated from university in 2010 and I keep only seem to manage to get temporary contracts rather than a secure job like a lot of my fellow graduates. What makes it worse is how I see terrible work that others are being paid to do while I struggle to get hired. I can’t look at the Hospiscare media any more because it makes me so annoyed with how badly some of my designs have been warped or ruined. Just before I left the charity I redesigned the art direction of the newsletter to make it more interesting and just generally well designed. The last two copies of the newsletter however have ruined the style ignoring basic yet important design rules. So hopefully in the next few weeks, as well as moving to Brighton, I will also hopefully have myself a new job and will be able to blog again! It seems ranting about the illegal activity of Plants Galore in Exeter is the most searched post of my blog. Having dealt with various companies including a number of gardening centres when putting together media for Hospiscare’s Open Garden booklet, I have heard nothing positive come from anyone talking about Plants Galore. If you are going for an interview there, run! Want plants that last longer than a month, go elsewhere! I am glad I never got the job with my role now managing a team of 8 in a till recent events well respected organisation. I am making a real difference to an organisation and people’s lives. I just hope all who are looking for answers about that cesspit of a company do, no matter what it is. So it is 24th January and already I have failed to keep all my resolutions for the year! I tried to be healthy, write more and sing every day but this has flopped! So why do we try again every year? It is hope. This belief, however small, helps keep a smile on those facing death, with nothing currently good in their lives or who want to change their lives. important story for everyone. Hopefully I will keep my hope that even without resolutions I will be able to change things for the better in my life. I hope that you keep your hope too, whether you have or haven’t kept your resolutions, that you will be able to make a difference in your life! Maybe there is still hope that the world will one day be a better and beautiful place for us all. Today was my last day on my contract. I now have that scary period of unemployment. I don’t have the joy of leaving a job and walking straight into another this time but to the land of no money. The current climate is terrible for young people, more so than most people. Young people with limited experience are failing to get jobs they are better trained and talented at to an older generation who have this so called “vital experience”. I hope the situation improves, both for myself and the many others. Tonight I went out for dinner at the waterfront. The food was great, with a great range of yummy dishes awaiting to be eating. That us what happened though; we waited for over 20 minutes to be asked what we wanted to drink. It was different for the couple that turned up 15 minutes after us, as they were served straight away. This was not upsetting as it just became more a game to try and catch their attention as they disappeared. I do not like milk chocolate but I do like white chocolate. There are few desserts that I can eat because of this. So you can probably understand my excitement when I saw that there was white chocolate porfitoroles on the menu. You can probably understand my sadness when these white balls of yum came out smothered in milk chocolate sauce. I stood my ground and asked for one not with milk chocolate and thought I had my way till I opened up the little ball… It was full of milk chocolate cream! Why call it white chocolate when 90% of the chocolate was milk! After trying it and it being vile, I was seen by the same waitress dish push forward, and me looking like “a kid who had been told Santa had died just before Christmas” apparently. After a few minutes of trying to get me to try a another dish (making it my 3rd dessert attempt) we managed to escape, but it still annoys me. I was so happy to see that and it was an utter disappointment and dad ending to the night. Hopefully the next resturant outing will go better! So recently I have not been keeping up to date with my blogging. I apologuise; but I have been working hard on my portfolio so that I can look for a job. If you are interested at all, you can find it here. I would really like to hear what you like about it as I am trying to make it look amazing and read well so when I send the link to people for jobs, they will be impressed rather than underwhelmed. That does lead me to question, how are we in such a job realted mess? It seems that there are too many people all going for the same sort of jobs resulting in alot of unemployment. Having studied at UNiversity and worked in one, there are way too many people in education. I am not saying that only the richest should go, in fact the oppersite. Most of those I met with a very high intelligence were from poor families like me. It should only be the best that go, and not have 500 courses up and down the country for a subject that does not lead to a good job. All of my occupational therapist friends have jobs, as do the engineers, but what about the drama, english and history students? They are working in a pub, tesco or other very low paid job. So what is the point of so many going to university? If there were not as many going then the stress on the government concerning tution fees would not be as high, but what awaits for those who do not go to University? Why are there not enough apperenterships around even for the 50% that aren’t going to university? Nothing will solve my impending unemployment, nor the millions that have it awaiting them after university, but hopefully my absence from blogging to work on my portfolio will!